Here's a short video tutorial on how to choose the right SAF radio using our Radioguide web tool. In order to use it, you'll need to register and/or log-in to our website. When logged-in, you'll need to go to the User area section and choose Radio Guide. SAF Radioguide provides access to all SAF point-to-point microwave radio product numbers and the exact technical specificatoin. 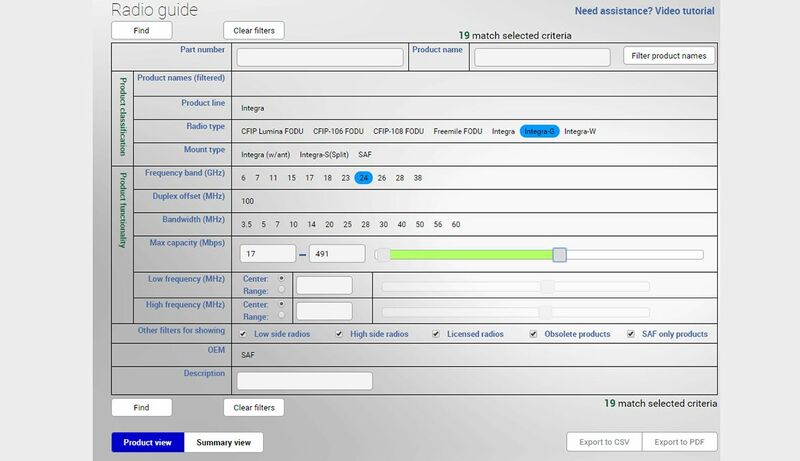 For each radio there are multiple ways how the radio guide tool can help by providing the right part number and radio specification. You can use multiple filtering options to find the exact radio that best fits your requirements. When finished, you can export your results as CSV or PDF files.